These highlights do not include all the information needed to use OXTELLAR XR safely and effectively. See full prescribing information for OXTELLAR XR. Pediatric Patients: The recommended dosage is based on body weight and is administered orally once per day. Increase the dosage in weekly intervals based on clinical response and tolerability, to the recommended dosage ( 2.2). Most commonly observed (≥5% and more frequent than placebo) adverse reactions in adults were dizziness, somnolence, headache, balance disorder, tremor, vomiting, diplopia, asthenia, and fatigue ( 6.1). Adverse reactions in pediatric patients are similar to those seen in adult patients. Phenytoin, Carbamazepine, and Phenobarbital: Coadministration decreased blood levels of an active metabolite of Oxtellar XR ®: Greater dosage of Oxtellar XR ® may be required ( 2.5, 7.2). Pregnancy: May cause fetal harm. ( 5.9, 8.1). Oxtellar XR ® is indicated for the treatment of partial-onset seizures in patients 6 years of age and older. Initiate treatment at a dosage of 600 mg/day given orally once daily for one week. Subsequent dosage increases can be made at weekly intervals in 600 mg/day increments to achieve the recommended daily dosage.Initiate treatment at a dosage of 600 mg/day given orally once daily for one week. Subsequent dosage increases can be made at weekly intervals in 600 mg/day increments to achieve the recommended daily dosage. 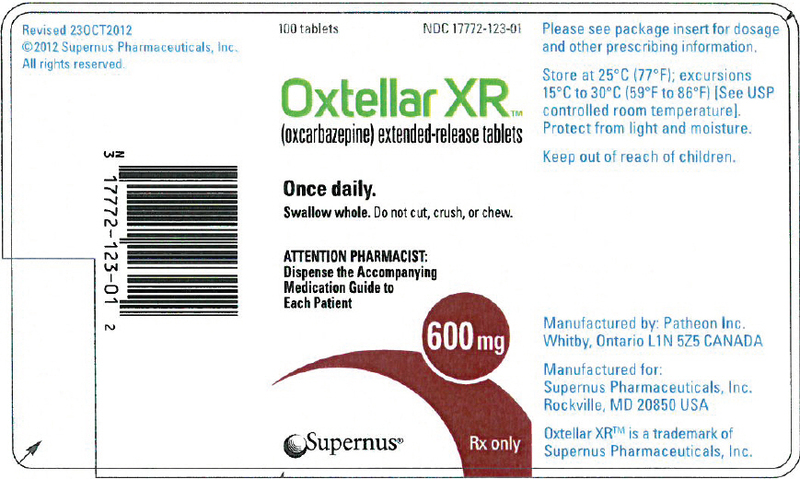 The recommended daily dosage of Oxtellar XR is 1200 mg to 2400 mg/day, given once daily. The dosage of 2400 mg/day showed slightly greater efficacy than 1200 mg/day, but was associated with an increase in adverse reactions The recommended daily dosage of Oxtellar XR ® is 1200 mg to 2400 mg/day, given once daily. The dosage of 2400 mg/day showed slightly greater efficacy than 1200 mg/day, but was associated with an increase in adverse reactions [see Adverse Reactions (6.1) and Clinical Studies (14.1)]. In pediatric patients 6 to less than 17 years of age, initiate treatment at a daily dosage of 8 mg/kg to 10 mg/kg orally once daily, not to exceed 600 mg per day in the first week.In pediatric patients 6 to less than 17 years of age, initiate treatment at a daily dosage of 8 mg/kg to 10 mg/kg orally once daily, not to exceed 600 mg per day in the first week. Subsequent dosage increases can be made at weekly intervals in 8 mg/kg to 10 mg/kg increments once daily, not to exceed 600 mg, to achieve the target daily dosage. The target maintenance dosage, achieved over two to three weeks, is displayed in Table 1.Subsequent dosage increases can be made at weekly intervals in 8 mg/kg to 10 mg/kg increments once daily, not to exceed 600 mg, to achieve the target daily dosage. The target maintenance dosage, achieved over two to three weeks, is displayed in Table 1. Dosage adjustment is recommended with concomitant use of strong CYP3A4 enzyme inducers or UGT inducers, which include certain antiepileptic drugs (AEDs) [see Drug Interactions (7.1, 7.2))]. Strong CYP3A4 inducers, including enzyme-inducing antiepileptic drugs such as carbamazepine, phenobarbital, and phenytoin, and UGT inducers (e.g., rifampin) decrease exposure to 10-monohydroxy derivative (MHD), the active metabolite [see Drug Interactions (7.2) and Clinical Pharmacology (12.3)] . Dosage adjustment of Oxtellar XR may be required after initiation, dosage modification, or discontinuation of such inducers. Dosage increases of Oxtellar XR may be necessary with concomitant use. Consider initiating at 900 mg once daily for adults and 12 to 15 mg/kg orally once daily (not to exceed 900 mg per day in the first week) in pediatric patients. As with most antiepileptic drugs, Oxtellar XR ® should be withdrawn gradually because of the risk of increased seizure frequency and status epilepticus [see Warnings and Precautions (5.6)]. Oxtellar XR ® is contraindicated in patients with a known hypersensitivity to oxcarbazepine, to any of the components of Oxtellar XR, or to eslicarbazepine acetate. Reactions have included anaphylaxis and angioedema [see Warnings and Precautions (5.2, 5.3)]. Clinically significant hyponatremia (sodium <125 mmol/L) may develop during Oxtellar XR use. Serum sodium levels less than 125 mmol/L have occurred in immediate-release oxcarbazepine-treated patients generally in the first three months of treatment. However, clinically significant hyponatremia may develop more than a year after initiating therapy. Clinically significant hyponatremia (sodium <125 mmol/L) may develop during Oxtellar XR ® use. Serum sodium levels less than 125 mmol/L have occurred in immediate-release oxcarbazepine-treated patients generally in the first three months of treatment. However, clinically significant hyponatremia may develop more than a year after initiating therapy. Most immediate-release oxcarbazepine-treated patients who developed hyponatremia were asymptomatic in clinical trials. However, some of these patients had their dosage reduced, discontinued, or had their fluid intake restricted for hyponatremia. Serum sodium levels returned toward normal when the dosage was reduced or discontinued, or when the patient was treated conservatively (e.g., fluid restriction). Cases of symptomatic hyponatremia and syndrome of inappropriate antidiuretic hormone secretion (SIADH) have been reported during post-marketing use of immediate-release oxcarbazepine. Among treated patients in a controlled trial of adjunctive therapy with Oxtellar XR in 366 adults with complex partial seizures, 1 patient receiving 2400 mg experienced a severe reduction in serum sodium (117 mEq/L) requiring discontinuation from treatment, while 2 other patients receiving 1200 mg experienced serum sodium concentrations low enough (125 and 126 mEq/L) to require discontinuation from treatment. The overall incidence of clinically significant hyponatremia in patients treated with Oxtellar XR was 1.2%, although slight shifts in serum sodium concentrations from Normal to Low (<135 mEq/L) were observed for the 2400 mg (6.5%) and 1200 mg (9.8%) groups compared to placebo (1.7%). Among treated patients in a controlled trial of adjunctive therapy with Oxtellar XR ® in 366 adults with complex partial seizures, 1 patient receiving 2400 mg experienced a severe reduction in serum sodium (117 mEq/L) requiring discontinuation from treatment, while 2 other patients receiving 1200 mg experienced serum sodium concentrations low enough (125 and 126 mEq/L) to require discontinuation from treatment. The overall incidence of clinically significant hyponatremia in patients treated with Oxtellar XR ® was 1.2%, although slight shifts in serum sodium concentrations from Normal to Low (<135 mEq/L) were observed for the 2400 mg (6.5%) and 1200 mg (9.8%) groups compared to placebo (1.7%). Measure serum sodium concentrations if patients develop symptoms of hyponatremia (e.g., nausea, malaise, headache, lethargy, confusion, obtunded consciousness, or increase in seizure frequency or severity). Consider measurement of serum sodium concentrations during treatment with Oxtellar XR , particularly if the patient receives concomitant medications known to decrease serum sodium levels (for example, drugs associated with inappropriate ADH secretion). Measure serum sodium concentrations if patients develop symptoms of hyponatremia (e.g., nausea, malaise, headache, lethargy, confusion, obtunded consciousness, or increase in seizure frequency or severity). Consider measurement of serum sodium concentrations during treatment with Oxtellar XR ®, particularly if the patient receives concomitant medications known to decrease serum sodium levels (for example, drugs associated with inappropriate ADH secretion). As with most AEDs, Oxtellar XR ® should be withdrawn gradually because of the risk of increased seizure frequency and status epilepticus. But if withdrawal is needed because of a serious adverse event, rapid discontinuation can be considered. Drug Reaction with Eosinophilia and Systemic Symptoms (DRESS), also known as multi-organ hypersensitivity, has occurred with immediate-release oxcarbazepine. Some of these events have been fatal or life-threatening. DRESS typically, although not exclusively, presents with fever, rash, lymphadenopathy, and/or facial swelling, in associated with other organ system involvement, such as hepatitis, nephritis, hematologic abnormalities, myocaraditis, or myositis sometimes resembling an acute viral infection. Eosinophilia is often present. This disorder is variable in its expression, and other organ systems not noted here may be involved. It is important to note that early manifestatios of hypersensitivity (e.g., fever, lymphadenopathy) may be present even though rash is not evident. Oxtellar XR ® should be discontinued if an alternative etiology for the signs and symptoms cannot be established. 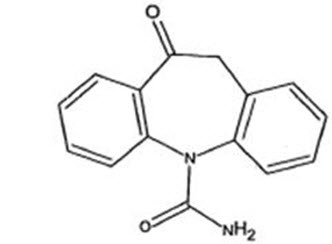 Exacerbation of or new onset primary generalized seizures has been reported with immediate-release oxcarbazepine. The risk of aggravation of primary generalized seizures is seen especially in children but may also occur in adults. 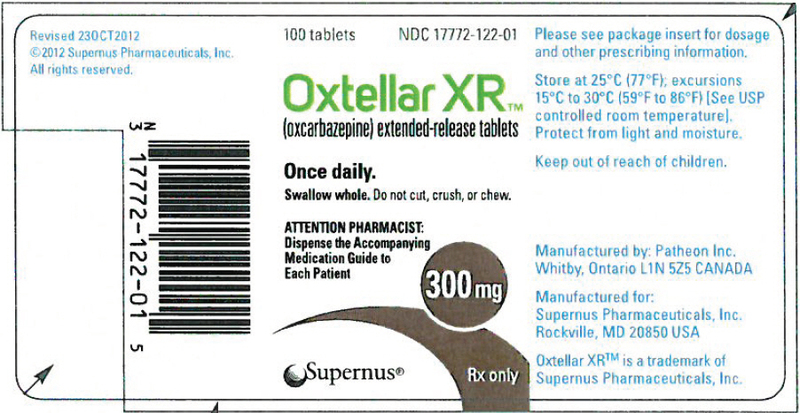 In case of seizure aggravation, Oxtellar XR ® should be discontinued.